Semi-secluded and nicely wooded square 10 acres m/l of vacant land on a county maintained road. Would make an excellent building site, or camping spot. With both State and Federal Lands only a short drive away, the possibilities for outdoor recreation are endless. Available on Land Contract. Owned & offered by a licensed Real Estate Broker. Great 2.5 wooded acres close to town amenities. Offers seclusion on a a dead end road and is very close to the ORV trail system. Electric is available at at the road. This piece would be a great camping site - accessible all year round. Location Location! 5 acres of possibilities located on a county road just outside of Luther. Terrific area for ORV riders with trail head not far away. Little Manistee River and 1000's of acres of state land within a mile of this location. Front half of property has been cleared to allow for a building site with the back half still fully wooded. Nice hills that offer a great view. Owner pulled all stumps when it was cut and has taken good care of it since then, drive way already in place. Make this your weekend location for hunting, fishing, ORV riding or just plain old camping. Less than a mile to Luther for groceries and restaurants. Call listing agent for a showing today! Great Building OR Camping Spot. Sitting up high with a great view of Orchard Lake, perfect for a walkout basement. Located on a county maintained road for easy year around access, yet secluded. BORDERS HUNDREDS OF ACRES OF FEDERAL LAND for great hunting and trail riding. Lovely 4 acres with TIN CUP TRAILHEAD right next door AND bordering thousands of acres of STATE LAND for endless riding and hunting possibilities! Located on paved Kings Hwy for easy access yet it is still secluded; sitting on top of a small hill with electric available right at the road. An all around great location. Land Contract Terms Available: Nearly 4 Acres of nicely wooded vacant land close to public lands and the trails. An excellent base for camping, hunting, fishing and riding the trails! Available on a land contract, what could be better? Owned and offered by a licensed real estate broker. Taxes to be assessed in 2020. Land Contract Terms Available: Nicely wooded 2+ Acres close to public lands and the trails. An excellent base for camping, hunting, fishing and riding the trails! Available on a land contract, what could be better? Owned and offered by a licensed real estate broker. Taxes to be assessed in 2020. Semi-secluded and nicely wooded 10 square acres of vacant land on a county maintained road. Would make an excellent building site, or camping spot. With both State and Federal Lands only a short drive away, the possibilities for outdoor recreation are endless. Available on Land Contract. Owned & offered by a licensed Real Estate Broker. 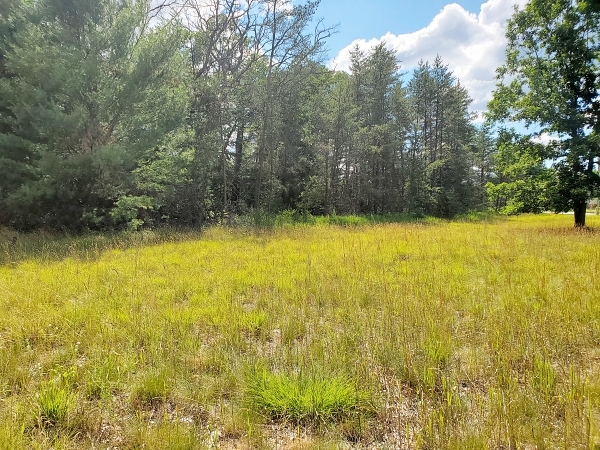 Nicely wooded 10 acre parcel in the heart of the Manistee National Forest. There is Federal Land just feet from the property and additional Federal Land located just north of this parcel. What a beautiful piece of heaven to make your own! Feel free to walk the land anytime. Fully wooded parcel in a terrific area, known for good deer and small game hunting. Plenty of deer sign throughout and a nice mix of trees that provides a lot of cover. Located on a dirt, county maintained road that is off the beaten path but still easily accessed off of M37. Would also make a nice spot to build a home or cabin. Less than half mile to Federal land and 20 minutes to US 131. Beautiful 10 acres in the Deer Lake Estates Association. 1/4 mile east of thousands of acres of Federal Land. $150 a year assoc fee pays for snowplowing and garbage. Nicely wooded parcel in the Branch area just off of US-10 not far from Ward Lake. Touches over 500 acres of Federal Land to the north for hunting. Could be a nice spot to set up deer camp or possibly build a cabin. Quiet area that can be easily accessed all year with A LOT more Federal Land just down the road. Great hunting property with great access! With this property comes access to Deer Lake. It is a great area and all the parcels are at least 10 acres so you will not have neighbors right on top of you. This property is secluded but yet you can get to all the stores and restaurants with in minutes. Available on a land contract and a great place to hunt or build your dream home. At this price it wont last long so call for a showing today! ORV Rider Heaven! Little ''O''? Tin Cup? Sound familiar? With the Little Manistee Trail right across the street you can have it all right at your wheel tips :) This one acre parcel comes with a well maintained 42' long, 1984 Elkhart Traveler 5th Wheel Camper that has been upgraded including a stackable washer and dryer, oversize fridge, and new tires. Two 1-1/4" wells, 800 gallon septic, and electric already in place. Located off of M-37 for easy year around access and across the street from thousands of acres of State Land. Land Contract Terms Available: Beautifully wooded 2.5 acres in un-zoned Cherry Valley. State land is just across the road making this an excellent hunting/camping base. For those who love riding the trails, the Tin Cup Spring Trail is close by. Electric is available at the road. Land Contract Terms Available: Beautifully wooded 2.5 acres in un-zoned Cherry Valley. State land is just down the road making this an excellent hunting/camping base. For those who love riding the trails, the Tin Cup Spring Trail is close by. Electric is available at the road. Level and wooded, this 3 acre parcel has frontage on a county maintained road with electric available. Just north of Baldwin and not too far off of M-37 so access is a cinch. Great spot to build a cabin or home or just camp and enjoy the outdoors. Excellently located 2 acres right in Irons! A great opportunity to build or camp. The property already has a clearing in place ringed with some very nice trees. Access is not a problem, off county maintained Brooks Rd. with Federal land right across the street for hiking, hunting, or to just enjoy nature! Land Contract Terms Available: Semi-secluded and nicely wooded 5 acres of vacant land on a county maintained road. Would make an excellent building site, or camping spot. With both State and Federal Lands only a short drive away, the possibilities for outdoor recreation are endless. Land Contract Terms Available: Nicely wooded 7.5 acres m/l with access from a county maintained road. Enjoy as a camping site or build a cabin for a hunting camp base. The recreational opportunities are nearly limitless with Federal land only a mile away. Land Contract Terms Available: Nicely secluded 10 acres with a lot of wild life! Come and enjoy this great hunting property that adjoins hundreds of acres of the Manistee National Forest. There is no end to the opportunities to hunt, hike or just enjoy some peace and quiet. With access by easement only you will never be disturbed. Having already been surveyed, this is a beautiful opportunity to own your own piece of what Northern Michigan has to offer. Land Contract Terms Available:Nicely wooded 2+ Acre vacant land. A perfect spot to get away up north for the weekend to go camping! Close to public lands yet not too far off the beaten path. Access is by easement from a county road. Land Contract Terms Available: Nicely wooded 1+ Acre vacant land. A perfect spot to get away up north for the weekend to go camping! Close to public lands yet not too far off the beaten path. Access is by easement from a county road with underground electric already on site. There is a nice clearing in place, just waiting for a camper or a cabin. Land Contract Terms Available: Nicely wooded 1+ Acre vacant land. A perfect spot to get away up north for the weekend to go camping! Close to public lands yet not too far off the beaten path. Access is by easement from a county road. Land Contract Terms Available: Nicely wooded 1+ Acre vacant land. A perfect spot to get away up north for the weekend to go camping! Close to public lands yet not too far off the beaten path. Access is by a county road. Land Contract Terms Available: Nicely wooded 1.4 Acre vacant land. A perfect spot to get away up north for the weekend to go camping! Close to public lands yet not too far off the beaten path. Access is by a county road. Land Contract Terms Available: Nicely wooded 2.4 acres of vacant land. Access from a county maintained road with electric available at the street. Ideal camping location close to town and amenities. Land Contract Terms Possible: 2.69 acres within walking distance to Federal Land. Borders snowmobile trail 340. Great spot for hunting or camping. Easy access from a paved, county maintained road. Additional acreage available. What a great price for 3.29 acres with WELL, SEPTIC, and ELECTRIC!!! In the perfect up north location! State and federal land within 1/4 mile and the ORV trails are close by also! Any recreational activity that you might enjoy is practically around the corner. Come take a look!!! Land Contract Terms Available: Nothing beats Northern Michigan in the summer, so call today and own a piece of the excitement! Nicely wooded ten acres close to public lands and trail access. Year round enjoyment can be had on nearby snowmobile & ATV trails along with hunting, or fishing in the nearby lakes and rivers. Know the joy of real property ownership with this little piece of heaven. Additional acreage available. Land Contract Terms Available: Parcel 2, Nicely wooded ten acres close to public lands and trail access. Know the joy of real property ownership with this little piece of heaven. Year round enjoyment can be had on nearby snowmobile & ATV trails along with hunting, or fishing in the nearby lakes and rivers. Nothing beats Northern Michigan in the summer, so call today and own a piece of the excitement. Additional acreage available. More Details Low Down Land Contract Terms Available: Village of Baldwin. 1.8 acres within the village limits. Great year round location on one of the main corners leaving town to the west. Property has frontage on 2 roads and has the potential of being split for further development. Property is subject to easement for the existing billboards. This property is owned by John R. Weeks, a licensed real estate broker.